This is a free web tool for people to set up either for themselves, or for another internet user. The tool features a simple home page made up of buttons (links) to the users favourite webpages, and allows the person using the web tool to access the internet in a safe and comfortable interface ‘environment’ until their confidence grows. This tool is a great resource for someone who has less confidence with computers, and as a result has been used widely by digital inclusion networks including the UK Online Centre, Age UK and RaceOnline. It is also the only example I have come across so far that offers a tool for an individual to use, in order to help them navigate the internet in a more user-friendly, accessible way in accordance with their particular needs or comforts. This was a quirky advertising campaign to help raise the profile of digital inclusion tools, such as the example of Internet Buttons. The towels are a combination of the traditional skill of embroidery, alongside the modern technique of digital communication, (in this case Twitter) and it shows a positive physical example of the benefits of cross-generation interactions and sharing. 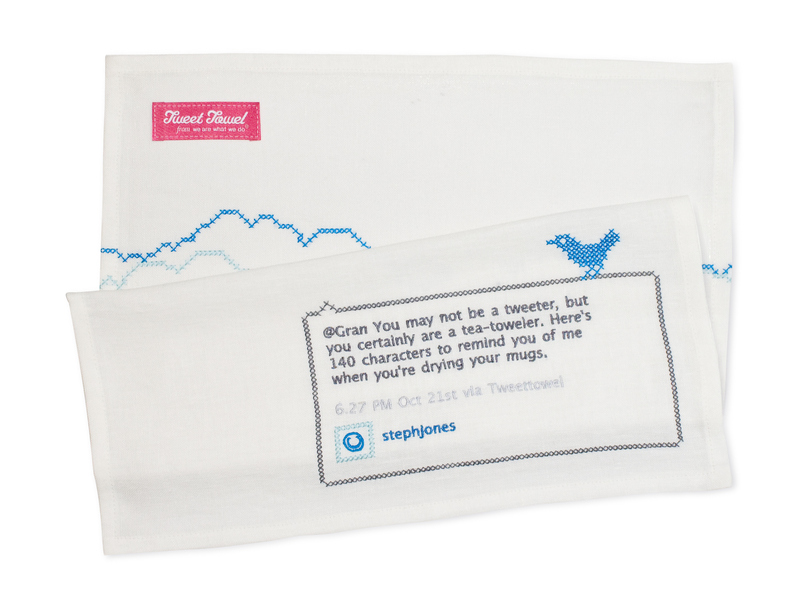 What I think is so clever about this approach was that as part of the campaigns strategy, Tweet Towels were sent to high profile digital bloggers and tweeters, whose subsequent public reactions helped raise the profile of We are What We Do and encouraged those with high digital skills to find out more about those who are digitally less able.